Posh skipper Chris Forrester in action against Chelsea. Photo: Joe Dent/theposh.com. Man-of-the-moment Chris Forrester insists January transfer speculation won’t affect his performances for Peterborough United. The Posh skipper became the focus of national attention following a superb individual display in last weekend’s (January 8) FA Cup defeat at Chelsea. Chris Forrester signs for Posh in September, 2015. Photo: Joe Dent/theposh.com. The club are now bracing themselves for big money bids for a midfielder who cost just £20k to buy from Irish League side St Patrick’s Athletic 16 months ago. Forrester has been ‘bigged’ up by Posh chairman Darragh MacAnthony this week. The said it would take an offer of ‘millions and millions’ to make him even contemplate selling his star man. But Forrester said: “It’s nice to hear and read so many compliments and I hope I continue to play well enough to generate some more. “But transfer speculation will never affect my form. It’s something out of my control. Posh midfielder Chris Forrester celebrates a goal against Millwall last season. Photo: Joe Dent/theposh.com. “If it happens it happens and if it doesn’t it won’t bother me at all. “Peterborough gave me my chance in the Football League. I have loved every minute of my time here and I signed a new contract last summer because I am very happy at the club. “I’ve always had faith in my ability, but it’s gone far better here than I dared imagine when I signed. “The Chelsea game was obviously a career highlight for me. To compete against so many great players at a big stadium in front of a huge crowd was just amazing. “I was proud to be captain of a team that played with so much spirit. We tried to take the game to Chelsea and at times it worked. “But Bury this Saturday (January 14) is a bigger game for me because I want to achieve success with Peterborough this season and that means promotion. MacAnthony admitted some top clubs have already shown an interest in Forrester, and he’s not surprised. 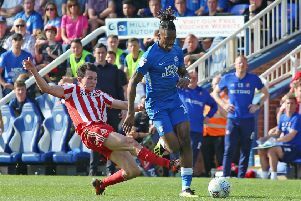 MacAnthony said: “Chris Forrester is the best midfielder by a mile in League One and plenty of big clubs are after him right now. “Chris will go on and be sold for millions and millions, and good luck to him if that happens because he has come to England, worked his socks off and turned himself into a top player. “We are talking about a player who is head and shoulders above the rest at the level he is playing at.